All Engelhard silver bars that were manufactured prior to 1980’s bear a unique serial number with Engelhard logo in the middle. This is a very important feature that enables you to track your silver bars in case they get stolen. Engelhard bars were produced in three sizes, namely, 1 oz, 10 oz and 100 oz silver bullion bars. 10 oz silver bullion bars are the most popular investment size that helps save on silver value over premium costs ratio and could be conveniently resold one by one once a need arises. These silver bars are no longer produced and could be purchased from other silver investors, silver parties or on EBay. 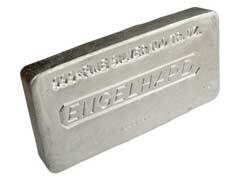 Engelhard top quality and immaculate reputation make Engelhard silver bars an excellent investment choice. Another characteristic feature of Engelhard silver bars is their shape that is wide and flat which is ideal for storage and transportation. Engelhard silver bars are the number one choice when it comes to silver investment. Please scroll over to learn more about Johnson Matthey silver bars. Academy silver bars as forms of silver investment.